Duits-Vlaamse Arbeidsgemeenschap ("German-Flemish Work Community"
​The Vlaams Nationaal Verbond ("Flemish National Union"), widely known by its acronym VNV, was a Flemish nationalist political party active in Belgium between 1933 and 1945. It became the leading force of political collaboration in Flanders during the German occupation of Belgium in World War II. Authoritarian by inclination, the party advocated the creation of a "Greater Netherlands" (Dietsland) combining Flanders and the Netherlands. Before the war, several Fascist movements had existed in Flanders. The two major pre-war Flemish Movement parties, the Vlaams Nationaal Verbond (VNV) and Verdinaso, called for the creation of an independent authoritarian Flanders or "Dietse Staat" encompassing both Flanders and the Netherlands. Shortly after the occupation, VNV decided to collaborate with the Germans and soon became the biggest group in Flanders, gaining many members after Verdinaso disbanded in 1941 and after fusing with the Flemish wing of the nationwide Fascist Rex Party. There was also an organisation, the Duits-Vlaamse Arbeidsgemeenschap ("German-Flemish Work Community", known by its acronym DeVlag), which advocated Nazi-style anti-clericalism and the inclusion of Flanders into Germany itself. During the occupation in World War I, the Germans had favoured the Flemish area of the country in the so-called Flamenpolitik, supporting Flemish cultural and political movements. This policy was continued during World War II, as the military government encouraged Flemish Movement parties, especially the VNV, and promoted Flemish nationalists, like Victor Leemans, to important administrative positions in the occupied territory. In turn, the VNV was important in recruiting men for a new "Flemish Legion", an infantry unit within the Wehrmacht, formed in July 1941 after the invasion of Russia. In 1943, the legion was "annexed" into the Waffen SS as the 27th SS Langemarck Division, despite the protestations of the party. The unit fought on the Eastern Front, where it suffered 10 percent casualties. The Germans also encouraged the formation of independent Flemish paramilitary organisations, such as the Vlaamse Wacht ("Flemish Guard"), founded in May 1941, which they hoped would eventually be able to act as a garrison in the region, freeing German troops for the front. From 1942, VNV's dominance was increasingly challenged by the more radical DeVlag, which had the support of the SS and Nazi Party. DeVlag was closely affiliated to the paramilitary Algemeene-SS Vlaanderen ("General-SS Flanders"), which was stationed in Belgium itself and involved in the so-called Antwerp Pogrom of 1941. When Nazi Germany invaded Belgium in 1940, De Clercq immediately chose to orientate the VNV towards collaborationism, despite his previous declarations that he would not do so. Adolf Hitler chose not to install a civilian government (such as he had done in the Netherlands) but instead installed a military administration headed by General Alexander von Falkenhausenof the Wehrmacht. This, along with the departure of Ward Hermans and René Lagrou to form the Algemeene-SS Vlaanderen, led the VNV out of focus, forcing it to intensify its collaboration in order to gain influence. Hitler and SS-leader Heinrich Himmler made profit from the situation, and increased competition between various groups by founding some more extreme collaborationist groups like the 6th SS Volunteer Sturmbrigade Langemarck and DeVlag ("German-Flemish Working Group"). Nevertheless, VNV politicians were given the mayor's office in several Flemish towns. VNV-led local administrations participated in the organisation of the deportation of Belgian Jews to Eastern Europe as part of the Holocaust in Belgium. They willingly implemented Nazi policies like the obligation of Jews to wear the yellow badge. VNV activists played a leading role in the anti-Jewish Antwerp pogrom of April 1941. De Clercq died suddenly in October 1942, and was succeeded by Hendrik Elias, a member of the more moderate side. Elias continued the collaboration but tried to come to terms with the military government to prevent the installation of a civilian government, which would be composed of Nazis. Elias failed, as Hitler installed the new body and declared the annexation of Flanders by Germany in 1944; seven weeks later, Belgium was liberated by the Allies. The VNV was outlawed after the liberation of Belgium. Elias fled to Germany, but was tried after the war and imprisoned until 1959. Though both Fascist and anti-Semitic, Rex's ideology had been more closely aligned with Benito Mussolini's Partito Nazionale Fascista than with the Nazi Party before the war. Rex's newspaper Le Pays Réel, which frequently attacked perceived Nazi anti-clericalism, had even been banned from circulation in Germany in the 1930s. With the German invasion, however, Rex rapidly accepted the occupation and became a major force in collaboration in Wallonia. A recruitment poster for the French-speaking 28th SS "Wallonien" division. 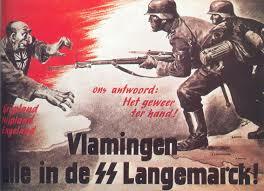 The caption reads "You defend Belgium... by fighting on the Eastern Front". As a result of the Flamenpolitik, Rex was not given the same favoured status accorded to Flemish Fascists. Nevertheless, it was permitted to republish its newspaper and re-establish and expand its paramilitary wing, the Formations de Combat, which had been banned before the war. In April 1943, Rex declared itself part of the SS. The Formations de Combatwere responsible for numerous attacks against Jews and, from 1944, also participated in arbitrary reprisals against civilians for attacks by the resistance. In 1944, Rexist paramilitaries massacred 20 civilians in the village of Courcelles in retaliation for an assassination of a Rexist politician by members of the resistance. Léon Degrelle, the founder and leader of Rex, offered to form a "Walloon Legion" in the Wehrmacht, but his request was denied by the Germans who questioned its feasibility. It was finally accepted in July 1941, after the invasion of Russia, and Degrelle enlisted. As part of the Flamenpolitik, the Germans refused Degrelle's demands for a "Belgian Legion", preferring to support the creation of separate linguistic units. After a brief period of fighting, it became clear that the Walloon Legion suffered from a lack of training and from political infighting. It was reformed and sent to the Eastern Front, and became part of the Waffen SS (as the 28th SS Wallonien Division) in 1943. During the fighting at the Korsun–Cherkassy Pocket, the unit was nearly annihilated and its popular commander, Lucien Lippert, was killed. In order to make up numbers, and because of a lack of Belgian volunteers, the unit was allocated French and Spanish volunteers. The 373rd infantry battalion of Wehrmacht, manned by Walloon Belgians, took part in anti-guerrilla actions in the occupied territory of the USSR from August 1941-February 1942. In May 1943, the 373rd infantry battalion was transformed into the 5th SS Volunteer Sturmbrigade Wallonien and sent to the Eastern Front. In the autumn, the brigade had been transformed into 28th SS Volunteer Grenadier Division Wallonien. Its remnants surrendered to British troops in the final days of war. 27th SS Infantry (Grenadier) Division. Flemish Belgian collaborators were organized first into the 6th SS Volunteer Brigade and later the 27th SS Infantry (Grenadier) Division.